Finding garage organization solutions may not be on your top 5000 favorite things to do... but, it's really not too painful if you take your time and try to have some fun with it. As with anything, getting started is often the hardest part. However, Once you get going, your garage will begin to transform and you'll be amazed by how much space you've created so quickly. Most likely your garage is full of items that can be grouped, labeled, and put away in boxes. If you don't want to use cardboard boxes, you can also use clear plastic containers. These are very nice because you can see what's inside while it's stored. You can find them at your local super-retail center, but they're a lot more expensive than cardboard boxes. Another great way to organize your garage clutter is to use a storage system. Garage storage systems range from simple and inexpensive to complex and expensive. If it's in your budget, some of the higher end storage systems are incredibly useful and elegant. So, if there's just one thing you should take with you from this page, it's remembering that garage organizing doesn't have to be painful. Just a little time spent organizing here and there makes a world of difference. It builds momentum and desire to do more. Before you know it, your garage is fully organized and you can find things as soon as you need them... every time. Have another look at the garage picture on this page. Notice how simple, yet effectively organized it is? Seriously... organization is a piece of cake. A little bit of will-power goes an incredibly long way in any garage. Most of all, have some fun with it. Ok, ok... how in the world can organizing a garage actually be considered fun? Well, everybody's different and there's no simple answer. However, if you take it one step at a time, you just might find that you're actually enjoying the process, let alone the overall results. 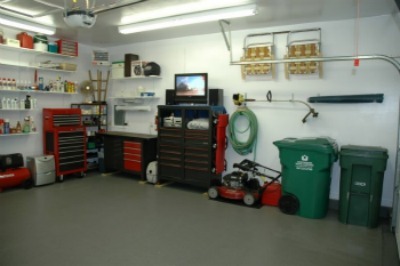 Here are some easy ideas for getting a jumpstart on organizing your home garage. Garage storage systems may be the perfect solution for you. Garage organization tips to help you get started and keep going.